Singing Mermaids – From SpongePedia, the biggest SpongeBob-wiki in the world! 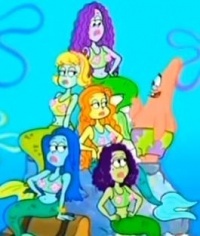 The Mermaids are characters from the episode Welcome to the Bikini Bottom Triangle. When SpongeBob, Gary, Squidward, and Squidward's stuff are missing, they head to Bikini Bottom Triangle and see Mr. Krabs with a masseuse. While on the island, SpongeBob and Patrick come across five mermaids. It shows the Mermaids sing which cause the stuff to come on their island. When they sing their song backwards, the stuff on the island is returned to its owner. They also want to go to the mall after Pearl informs them of it. In the cover of Legends of Bikini Bottom, SpongeBob is stuck in the main drain, Old Man Jenkins is hiding in the sand, Gary is on a parachute, and the Mermaids are cheering for SpongeBob for saving them, but Madame Hagfish helps Ma Angler to capture the Mermaids. It is seen that Patrick has a crush on them. This page was last modified on 15 August 2016, at 23:46.